Esco Global services takes professional pride in ensuring compliance with legal guidelines and ISO standards while helping your company minimize disruption or downtime of equipment; thus improving your company's productivity. Our Field Service Representatives have extensive annual up-to-date safety training. Our list of credentials includes NSF (for Biosafety cabinets) TÜV NORD (for microbiological & cytotoxic cabinets), NEBB (for clean room) and IFBA (for biorisk management). We provide comprehensive and reliable services through our extensive Global network of Field Service Representative to our clients that include dependable inventory of ready parts, technical support, field based engineering, factory engineers and after-sales representatives. On-site response within 24 hours for priority cases/ clients. Our 24/7 phone and site supports are also available for clients on premier service plans. Our Service Team is dedicated to providing service of the highest standards. We provide timely, responsive service while meeting or even exceeding customer's expectations. Our passion for excellence makes Esco an Excellent Service COmpany. Proper operation of Esco products usually requires periodic maintenance and/or decontamination in accordance with common Standard Operating Procedures and recognized laboratory safety protocols. 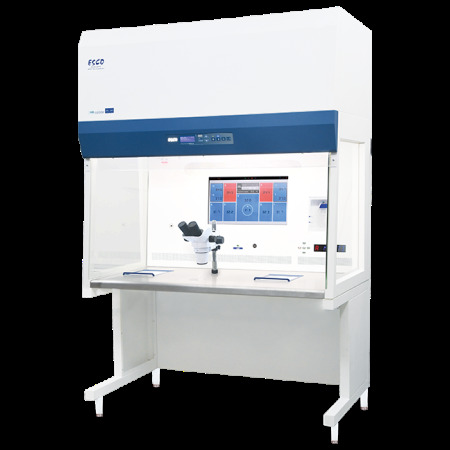 Decontamination is a process that reduces contaminants to acceptable levels in biological safety cabinets to eliminate their disease causing capabilities. Decontamination/fumigation using formaldehyde, hydrogen peroxide or other agents should only be carried out by trained personnel with proper knowledge and equipment. Preventive maintenance is a schedule of planned service measures aimed at the prevention of unexpected downtimes and failures through routine maintenance and early detection of problems. Esco global services ensure compliance to legal guidelines and standands. Standardized working procedures provide an uncomplicated validation of your system, from implementation to shut down. Esco offers service programs to meet your individual needs, and to keep your equipment in excellent working condition. Every Esco cabinet is manufactured as a commercial grade product and Esco provides replacements for consumable elements as well as any components that might fail while the product is in service. Every Esco product is shipped with a Statement of Part Numbers for Replaceable Parts. From time to time, Esco may use components from different sources or change them after design improvements. The serial number of a product, usually located on an identification tag on its upper front side, may be used to query an on-line database to retrieve accurate part numbers. In order to maintain consistent and safe operating conditions for any equipment, regular performance tests must be conducted. Esco's Validation and Certification Services can ensure that all Esco equipment is providing sufficient containment in the equipment's work areas and a pleasant working environment for its operators. Installation Qualification (IQ) documents that the specified equipment was received and properly installed in a suitable environment. IQ is also required for used equipment installation, equipment moved within a facility or connected to modified systems at the facility or subject to a changed SOP. IQ can be performed by the customer or Esco. Operational Qualification (OQ) documents that the equipment still meets its specifications after installation in the customer’s facility. OQ can be performed by the customer or Esco, and must be performed at least annually for every piece of equipment. Esco provides our customers instructions for IQ and OQ of our products. Esco also can perform these services directly on behalf of its customers or arrange them through independent approved local certifiers. The availability may vary from country to country and region to region. Also, Esco can train customer employees to perform IQ/OQ as described in the Aftermarket Support section later in this document. Esco offers training for users of its equipment on the procedures in its User and Service Manuals. Operational training includes product placement, electrical connection, connection to facility air handling system, adjustment of leveling feet and locking of casters, use of Sentinel Software and pressure measurement instrumentation, cleaning, decontamination and changing filters. Maintenance training includes the procedures used by our personnel and described above. You can assure that your personnel are prepared to deploy and use your Esco products. Certification training is similar in scope to the training described above, and includes hands on demonstration of the skills being taught. The use of certified personnel facilitates assessing utilization, productivity and risks of complicated or sensitive protocols. Those who complete Esco Certification Workshops will receive a certificate of attendance. Our knowledgeable consultants are regularly sought globally to provide our professional advisory to numerous regulatory bodies on standards development as well as re-evaluation of existing laboratory safety SOP and manuals that are closely relevant to the industry which our company is a global leader. As such we are extremely qualified to provide professional advisory pertaining to a wide arrays of projects such as BSL2, BSL3, Biorisk Management, Biohazard Waste Management, Pre-Laboratory Certification Assessment, Good Laboratory Practice, Good Clinical Laboratory Practice,Clean Room Design & Implementation in order to maximize your productivity and quality in accordance with the various regulations.